Rose In Black And White Step By Step Drawing Manual. 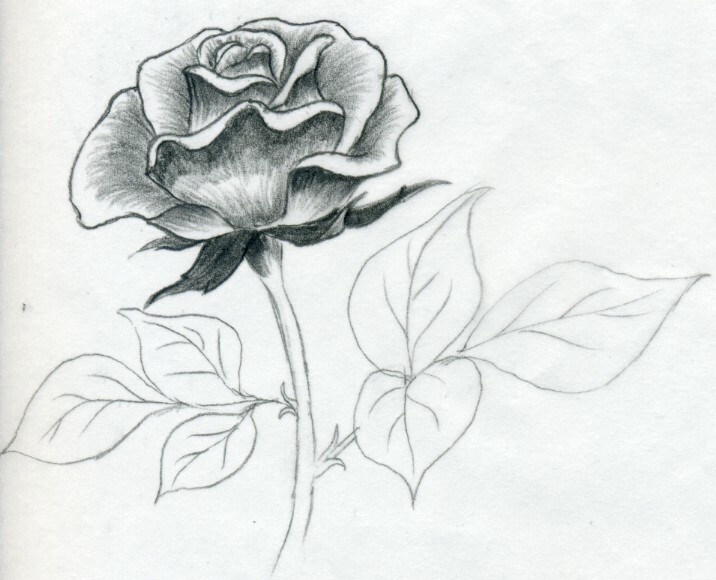 Let's draw a rose in black and white using only a standard HB graphite pencil. 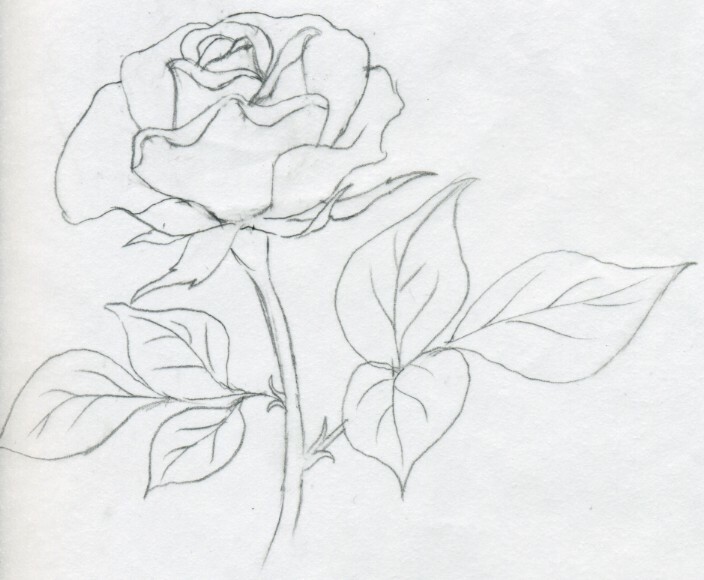 I won’t bother you with too much of my comment on this because all is pretty obvious from the pictures, and you have already learned the basic sequence from the previous rose drawings including the rose head. Start with a light wavy line. That represents the stem of the rose. 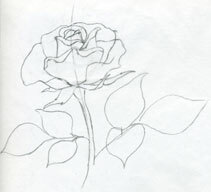 Then draw a chalice-shaped curve, which is the basic line of head of the rose. The final shape of your rose will depend on this initial chalice shape. If it is slim and longer, your rose will have a prolonged elegant shape. If the chalice is short and fat, the shape of your rose will be similar. My advice is – if you are uncertain – make it similar to this one, because this shape is rather neutral. 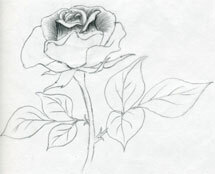 Now, when you’ve learned how to draw a rose in black and white, you can always draw, as many new roses as you wish. At this stage it is more just a rose bud than a rose. 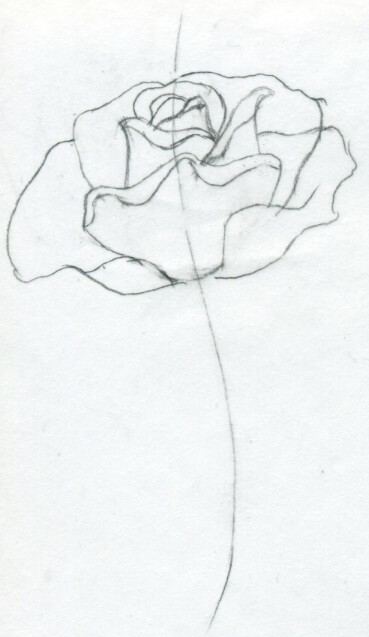 Draw the ending of not yet fully opened petals on the top of the head. Now, start to use your imagination. How would the petals look like when they are just about to open…? 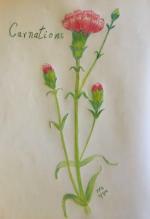 Go ahead, draw the petals, and do not mind so much about the shape. 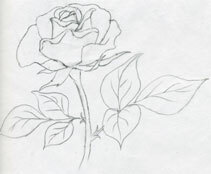 As you draw the petals, try to make the upper edge of the petals folded over a bit. 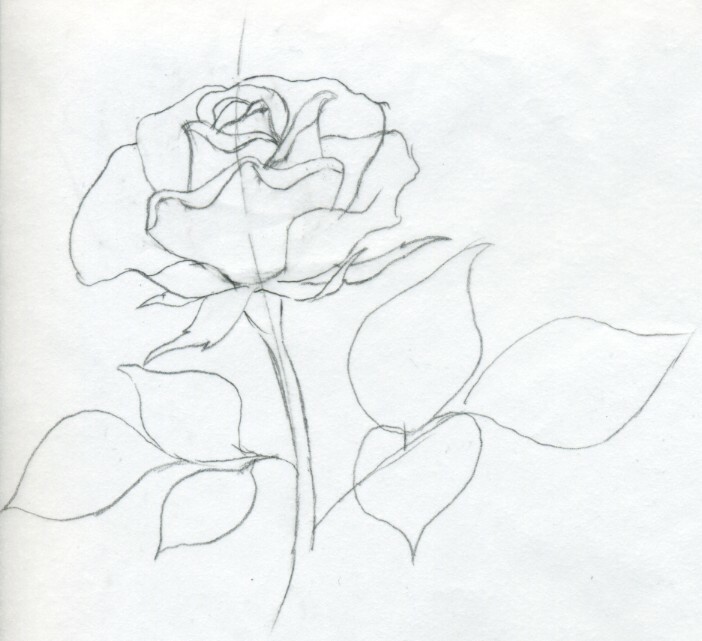 Always remember that you are learning a process of how to draw a rose, and no one expects you to be perfect on your first try. You can add now some more opened petals, the outer ones. You decide the shape. And, yes, erase the help lines and the previous petal lines that may still remain. Let’s add some leaves. 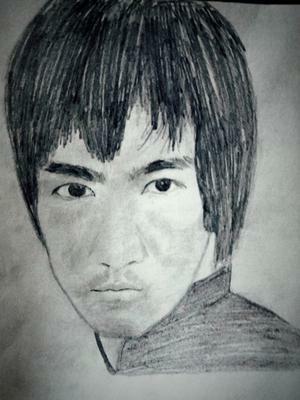 Just roughly sketch the contours of the leaves. 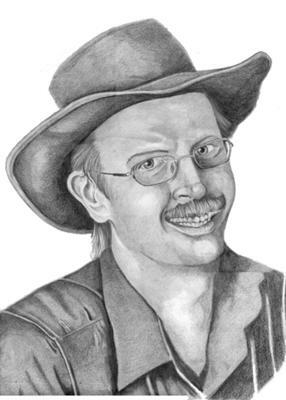 Now your drawing is getting closer to its final shape. 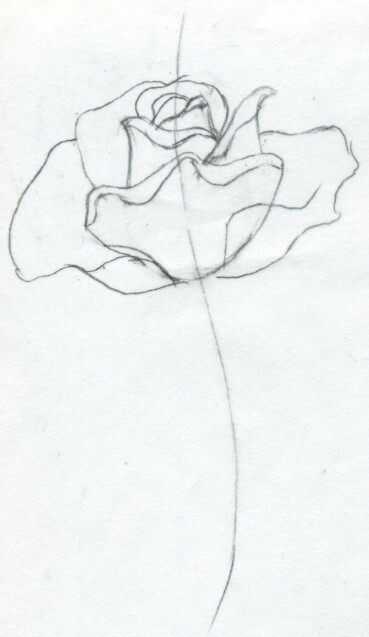 At this point you may begin to feel that you too have learned how to draw a rose. …and we finally got to the stage where the real fun begins. From now on it is a kind of coloring-book work. 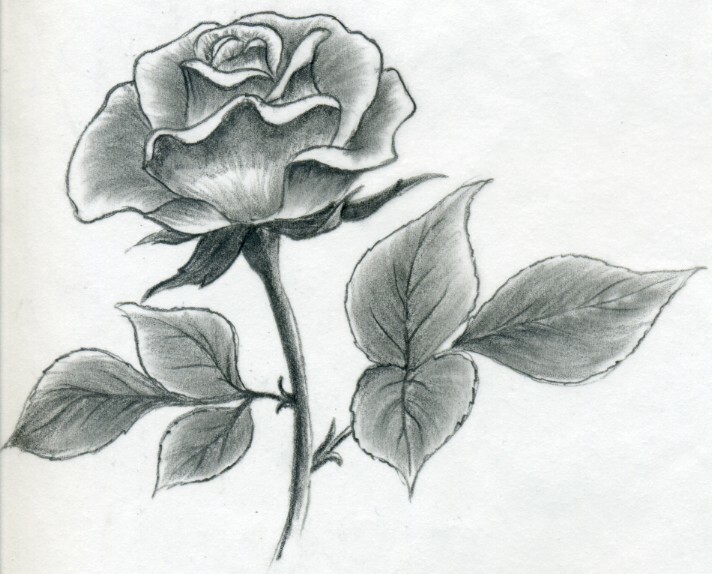 Use a HB pencil to add grayish tone, to shade the folds on the petals and the darker parts so the rose gets gradually three-dimensional. 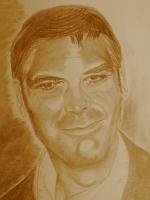 When you click to enlarge the image, you will notice how the pencil strokes have been done. If possible try to follow the petal shape with the pencil strokes. When you enlarge the image, you also notice that my pencil strokes aren’t perfect too..;-) While shading the leaves, please follow the veins with the pencil strokes; make the strokes in the same direction. Do not cross the veins with pencil. It will be visible and difficult to erase. 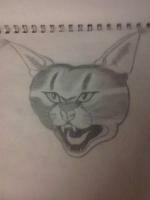 By now you should have a complete drawing on your table. If you are not fully satisfied with the strokes, or if some of them did not come out as you expected, simply take a cotton swab and blur or soften the strokes. Be very careful because the cotton swab is thicker than tip of the pencil and you may easily enter the white or lighter areas. Repeat the whole process, as many times as you feel you need to. Your hand will learn the lines and you won’t forget it. 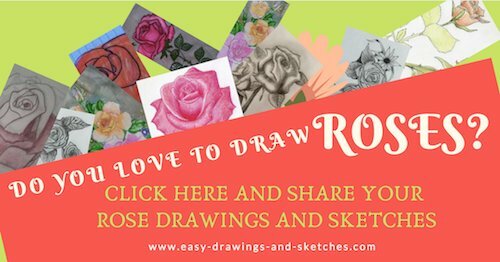 Show your friends how to draw a rose!